Sunday morning I began the day checking out food blogs looking for a new recipe for pie crusts and I lucked out when I turned to the Joy of Baking blog, where Stephanie Jaworski has a really great video (Sweet Pastry Crust Video) that gives you step-by-step instructions on making a fool-proof pie crust, which I used for my strawberry tarts. I know I have made a few strawberry recipes recently, so no more for a while (maybe in December right around the holidays – I have a dynamite Pavlova recipe that needs a little strawberry on the side). 1. Crust – Using the pie dough attachment, add butter and the sugar to your mixer and beat till smooth and creamy. Slightly beat the egg and then add to mixer. Blend, although it will no longer be creamy, but have some lumps. Add flour and salt and blend. Place dough on plastic wrap, smooth it out into a circle, wrap edges around it and place in refrigerator for 30 minutes. Take the chilled pie dough and cut into 6 pieces. 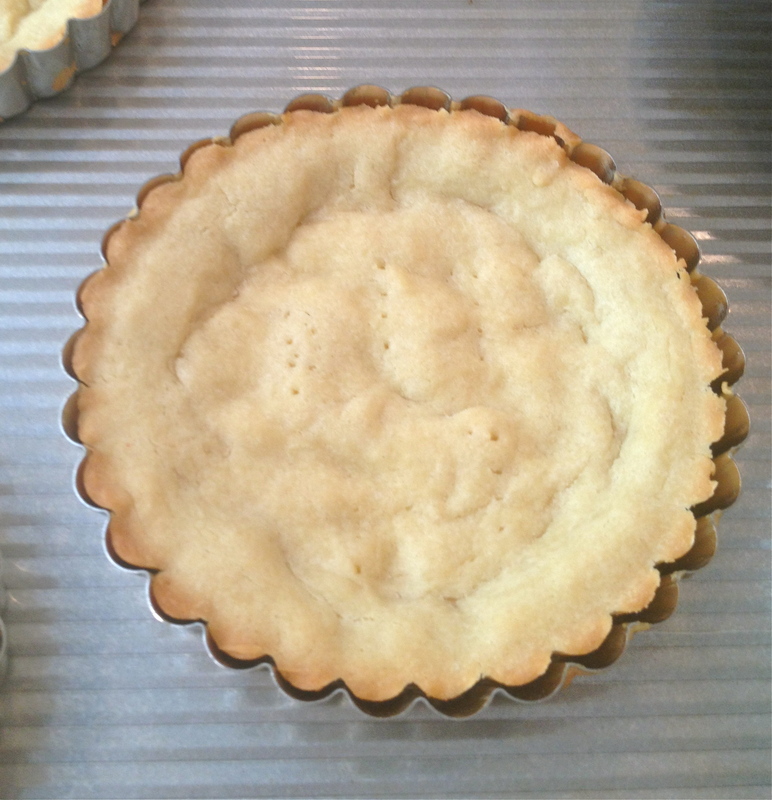 Lightly butter and flour your tartlet pans, or use non-stick spray (I used butter/flour). Place the dough in pan and gently press it up the sides and into all the fluted ridges and on bottom of pan. This dough is very pliable and it’s easy to do this. Place all the pans on a cookie sheet and place in the oven for 5 minutes at 400 degrees. Then turn it down to 350 for another 30 minutes. 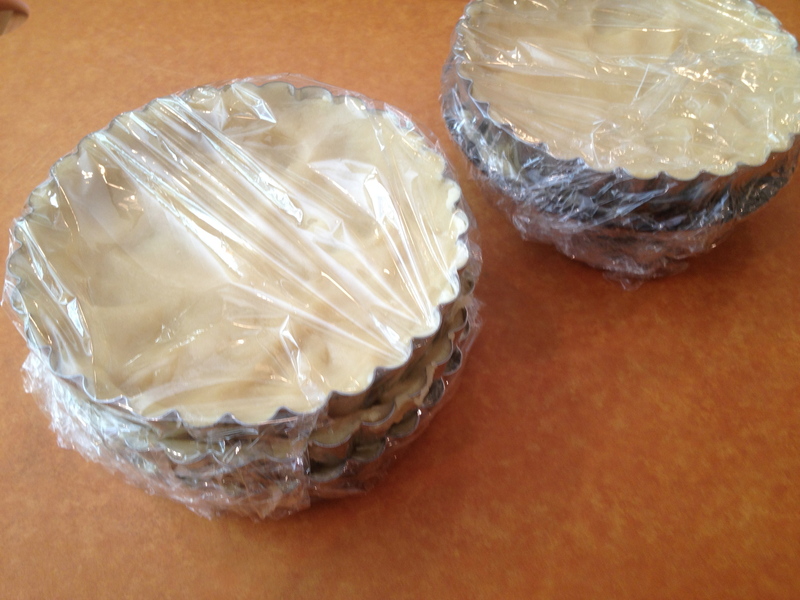 Tarts are ready when the pie crust is dry, set, and starting to brown along the top edges. 2. Glaze: Wash and hull the strawberries and set aside 2 cups of them. Using the remaining 2 cups add them to a bowl and mash them with potato masher till they are chunky and smashed. 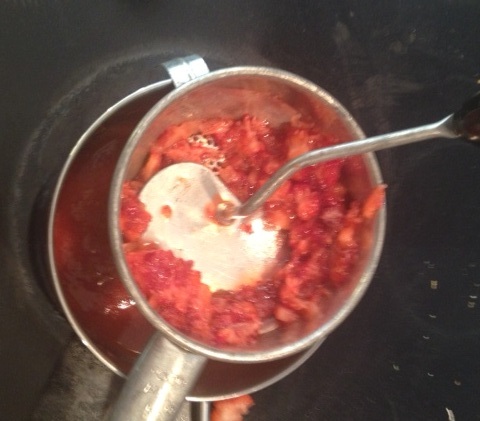 Using a food mill, press the strawberries through the mill so they are smooth and a sauce-like consistency. Add enough water to get 1.5 cups of sauce. Add to a pot and set on stove on medium high heat. Add 3/4 cup sugar and stir till the sugar is melted and well blended with the strawberries. Place the cornstarch in a small bowl and add a bit of the hot strawberry mixture and stir together – then add this back into the strawberry mix. Keep the heat on medium high and stir the mixture for about 10 minutes until it comes to a boil and starts to thicken. Remove from heat and put in refrigerator till chilled (about 30 minutes). 3. 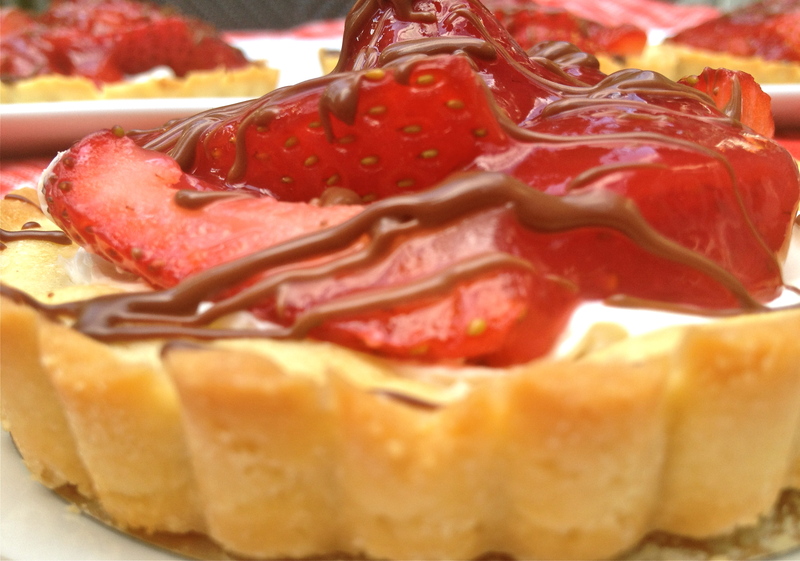 Ganache – While the strawberry sauce is chilling take the chocolate and cut into small chunks and add to a bowl. Heat the heavy cream in a microwave for about 2 minutes and then pour the hot liquid over the chocolate and stir well – you now have Ganache – set aside to cool on the kitchen counter for about 15 minutes. Then refrigerate for 20 minutes. 4. The tarts should now be cooked and ready to set on cooling racks – these need to be totally cool before you add the filling. 5. 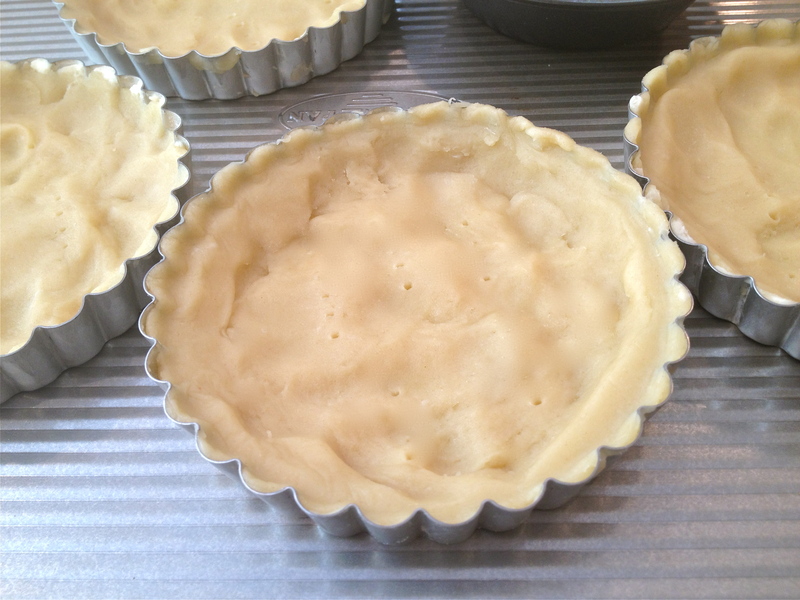 Once the tart shells are cool, spread the softened cream cheese on each tart. 6. 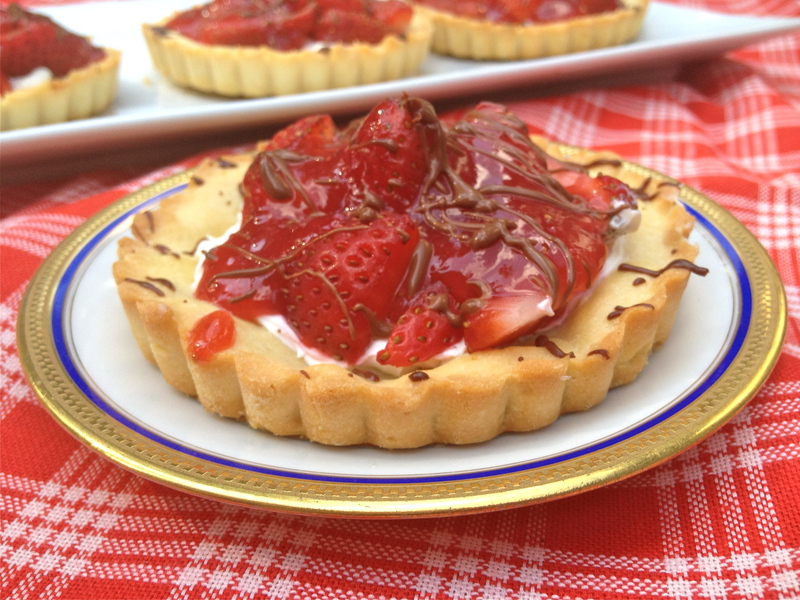 Add strawberries to the tarts using a one large berry in the center (stem down) and then fill in the rest of the tart with quartered strawberries. 7. Take the cooled sauce and gently spoon it over the strawberries in the tarts till there is glaze over all the berries. 8. Refrigerate the tarts for about 2 hours before adding the Ganache over the top using a fork and flinging the ganache in a back-and-forth motion to get strings of chocolate on the tarts. Very pretty and delectable. Yum! Looks and sounds fabulous. And I think I should get some tart pans and it made it so pretty. Thanks – I thought I would change it up a bit and give everyone their own “pie” this way! so cute! liking the chocolate drizzle especially.